Lately we’ve been getting a lot of requests about dark stained hardwood floors. Seems like deep, rich, dark colored floors are as popular as ever. We’ve been doing 3 to 5 of them a month lately. Good thing we love doing them! Can my Floors be Stained Dark? Does it Make a Difference What Kind of Wood I Have? If you have red or white oak (which makes up the majority of Naperville homes) then there is no problem at all. Oak takes a stain very well and we can stain from a light color all the way up to dark ebony. But if you have an exotic wood floor like Ipe or Jatoba, then we will strongly suggest that they should not be stained for two reasons… 1) they already look nice and dark naturally – these are the woods people try to emulate when they stain oak – so why mess with mother nature, and 2) they have natural oils in them that can make them extremely hard to get a consistent, even look. Pretty much as dark as you want really. It’s possible to make your hardwood floors solid black if you really want them to be that dark, but a lighter black or Jacobean or Coffee brown might look better in your setting. We’ll make up some large sample boards for you to view in your home setting to compare with each other so you can see for yourself how dark you can handle. What Dark Stain Colors and Mixes Are the Most Popular Right Now? Lately we have been doing a lot of Ebony with Jacobean and Ebony with Sedona Red. Both of those mixes look really nice. There are also a lot of clients sticking with 100% Ebony. We have samples of each that we can show you in person. How Easy Are They To Maintain? A lot of this comes down to the finish system you put on top of the stain not so much the color of the stain itself. The stain color will be covered by at least 3 coats of finish. Many of our clients love OSMO Polyx Oil (you can read about this finish here ) which is very easy to maintain as is our extremely durable high quality water based finish system. Will Dark Stained Floors Scratch Easy? This also depends greatly on the quality of the finish system used. If a cheap finish is applied then it will scratch as easy as a light colored floor with a cheap finish. The only difference is the scratch in the dark colored floor will show through more noticeably as the color of the natural wood underneath is lighter. It’s because of cheap, poor quality finishes that dark stained floors have this reputation of showing scratches easily. If you use a high-end professional grade finish system like we do at Tadas Wood Flooring, then you won’t have this issue to worry about. Will They Show Dirt More Than Lighter Colored Floors? Yes, unfortunately this is true. Dark floors are a lot more maintenance than medium or light colored wood floors. It’s just like how dark colored cars look dirtier quicker than beige cars… not that they are dirtier, but they look dirtier faster because you can see every light colored speck on them easier with the dark background. Hardwood floors are the same. Every single speck of dust, every single strand of dog hair and every tiny piece of lint will be much more noticeable on a dark surface. So… if you have a full house of kids running through, scuffing things up, tracking in dirt and dust and you don’t want the stress of continually cleaning up, you may want to consider a lighter color. If you have a white haired dog or cat that sheds a lot of hair and you don’t like to sweep up after them other than on weekends, then dark floors may not be for you. Will It Make My Room Look Too Dark? Again our answer for this is – it depends. Especially on the look and style you’re going for in your place. Most people that ask us this are looking for a more open, light feel. It’s pretty obvious that lighter floors will brighten up small dark rooms and make them look bigger because they reflect light. On the other hand, dark floors will absorb light and have the opposite effect in a small room. If you have bigger, more open rooms then it’s not as big an issue unless you have dark maroon or chocolate brown walls. But then again, walls can be easily painted to something lighter if need be. Dark stained floors will help anchor a room and give you the freedom to put light, bright colors on the walls – or even just white – that will add brightness to the room. We love this look and so do most designers we work with. It’s a very glamorous, classic look that will go with a lot of different furniture styles. We know this is one of the hardest decisions you’ll need to make when it comes to having your hardwood floors sanded and refinished. It’s even harder when you’re surfing the web trying to compare colors that don’t seem to match from one photo to the next. Our advice… don’t bother. The color will depend on the camera, the lighting, time of day, if the picture was photo shopped or not and a bunch of other factors. 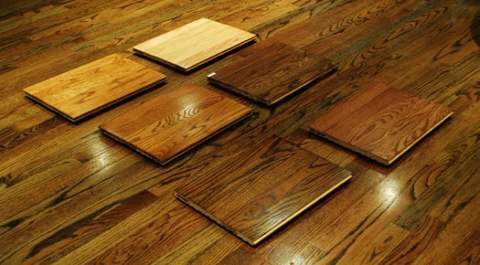 The best thing to do is have your professional hardwood floor refinisher come over with real samples that are a sufficient size (like you see below) to allow you to make a good decision. Put them in every room and live with them for a few days seeing how they look in different light and at different times of the day. It’s a big decision so you may as well take your time and get it right, it’s not easily reversible. In the end, staining hardwood floors is going to come down to personal choice just like a car color. Some people know that black cars are harder to keep clean but they love the look of them so much that they buy one anyways. That’s a personal decision you’ll need to make. When you do, if you live in Naperville or the surrounding area, we’ll be here to help transform those beautiful hardwood floors into the perfect shade of stain you’ve been dreaming about. I really hope that you can answer this soon, but in the 2nd to last pic with Ebony and Sedona Red, what are the mix ratios you have there? And how will an Ebony and Royal Mahogany mix look? thanks! It’s a mix of half and half. Ebony and Royal Mahogany looks great too. It’s a darker and richer color than Sedona Red and Ebony, a very nice blend. Thank you for the quick response! What ratio of royal mahogany and ebony would achieve a very dark wood look with a slight tinge of red in it? This is an update from my original post on 11-6-2013. I wanted to thank you on your informative website blog as well as your recommendation of 3/4 Ebony to 1/4 Royal Mahogany. I did just that to my white oak floors. 2 coats of it followed by a semi-gloss finish. The results are perfect. I love cleaning and admiring the hardwood floors of my very first home purchase. If I can figure out a way to post a pic here, I would. For what it’s worth, THANK YOU! I’d start with 3/4 Ebony to 1/4 Mahogany and take it from there. Just mix small amounts so you have plenty to experiment with. Hope you find a blend you love! 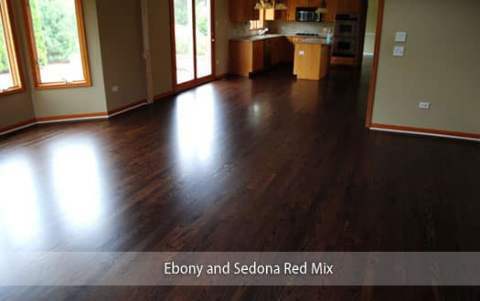 Hi there, I live in Estes Park, Colorado and I’m trying to convince the floor guy that I want a darker finish on my 80 year old red oak floors. I need the floors to be “cooler” in color so, not as yellow or red as a natural oak. 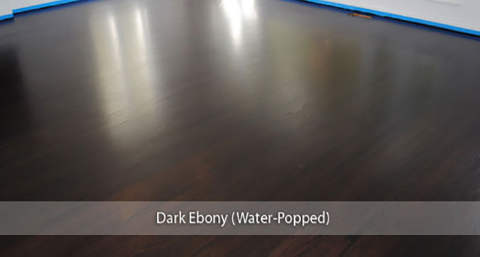 If I can’t go as dark as Ebony, I I’m wondering what the color of the floor is in the last picture on this web-site. It is the one with the six floor samples. That seems like a happy medium!! Dark floors can be a challenge though which is why some guys shy away from them. That floor you asked about is my living room floor – it’s 25% Ebony/ 75% Natural on water popped red oak with an oil based polyurethane applied. Hope you end up with a color you love. we live in the uk! 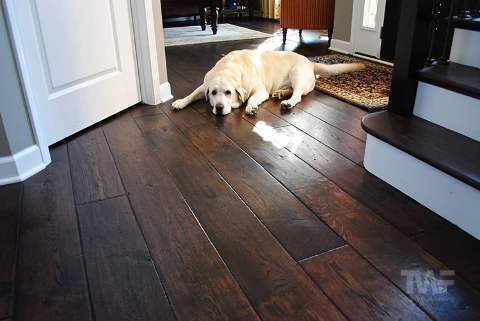 i wanted to ask, we wanted to do darker floors in our place, and we wanted to use the osmo polyx oil, but no one around us sells the osmo polyx tints…..so…..do you think it would be ok to use the clear polyx oil, over a different brand wood stain? if so, what should we look for in a stain to make sure it is compatible with the polyx oil??? Just make sure the stain is dry before applying the OSMO oil. We have used Duraseal and Minwax stains so you should have no trouble with either of those. If you’re concerned about compatibility always do a test sample to make sure. I’m trying to find a stain for my family room colums and mantle that will match my dark cherry cabinets. Would you use the same color on the wood floors as the columns? We have been looking at the Minwax colors. The color appears so much lighter on wood samples. Need some advice. Personally I would choose a different color for the colums than the floor color. You could go darker or lighter depending on your taste. Keep it within the same basic color range though. I love the ebony/Jacobean mix. What is the ratio? I’m pretty sure it was 50/50. Do you recommend Sherwin Williams or Minwax for an Ebony stain? We use Duraseal. It’s much better than Minwax because it acts like a sealer as well as a stain. They have pretty much the same colors too. We love reading your articles, extremely helpful and interesting! Great work you are doing here in Chicago! 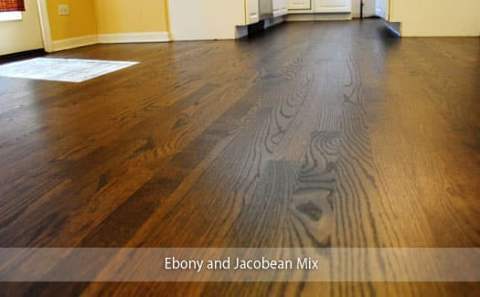 We decided to go with Ebony color (DuraSeal) on red oak floors. Still can’t decide on the finish. We are thinking to go with oil based polyurethane. In your last picture on this website, what is the finish type: Matte or Satin? That floor was coated with a satin finish. you mention Jatoba wood …. What would you use to protect? Want to keep color as natural as possible & really do not like the finish from poly / urethane products! Personally I would apply a low sheen/matte waterbased finish. This will preserve the natural color and not darken it like an oil based product would. Hi- we are struggling between jacobean, dark walnut and antique brown. We want something with no red in it and is pretty dark but not as dark as ebony. We see a lot on the web about jacobean and dark walnut but not as much about antique brown. Do you have thoughts on these 3 and why antique brown doesn’t seem to be as popular? Not sure why Antique Brown isn’t as popular but we do quite a few Jacobean floors. It’s a good shade that goes with a lot of styles. I think its popular because it’s not too dark and doesn’t have a reddish hue to it that is out of style at the moment. Whichever one of those 3 you choose will look great though. Hello. I am glad to have found your blog. I’m looking to refinish approx 1000 sq ft of red birch hardwood flooring. I’m just not in love with the lighter colored floor and wanted to go darker. I’ve read on other sites that birch does not take stain easily. Which process would you recommend? I like the satin finishes and am not opposed to one of the hard wax oils that you reviewed (Pullman, Rubio and Osmo). Whatever finish I ultimately decide on is going to have to stand up to my dogs and their “accidents”. Any help would be greatly appreciated. Birch will act like maple with stain – in other words it can be difficult if you don’t know what you’re doing. Pallmann Magic oil or Rubio would work fine. The only potential issue is the regular dog “accidents” you mentioned. Because of this I would lean towards staining with a regular stain and then finish with good commercial grade finish like Bona Traffic or or Pallmann 98. In either case the dog’s accidents could still ruin the floor if not taken care of right away. Yuck! I hate dog pee and carpets. You only really have two choices. The first is to use a very dark stain like you mentioned. The other is to remove and replace the damaged boards. Then you can use any color stain you like. The second option would depend on how extensive the damage is and the cost to do. In your photo with the six samples, can you tell me what each of them is and what finish you used. I’d also like to know if you used a water-based or oil-based finish. Wow that was a long time ago… let me see if I can remember. The finish would have been Pallmann 96 satin – a waterbased finish. Hi Tadas~ I’m a little nervous. I want a dark floor and I know the trend is for a satin finish but I’m concerned that if I use a satin finish it will look dull. I don’t want it to look like a basketball court (super shiny) but I’m worried it would look blah. Can I turn up the shine just a little more on a satin finish? Would water popping help a satin finish look a little more glossy. Am I wrong that satin finishes are dull looking? Sorry for the delay. Satin finishes are very nice and it’s the most common sheen we apply. It still has a nice sheen that’s not too shiny but no too dull like a matte or super-matte sheen. I would ask for a few samples on a largish board so you can compare each gloss level. And no, water popping will have no effect on the sheen level. i bought 5″ number 3 white oak for my apartment because I really liked the color differences between the boards. I’m wondering if you recommend staining dark or light on these floors? It’s hard for me to say one way or another without seeing your apartment and the color of your furniture, walls etc. Either dark or light looks good but if you really like the natural color in the boards then maybe lighter would be the best way to go. I want a modern look for my floors. .
what is ur opinion about provincial in minwax and what finish satin vs smigloss?will combination of provincial and dark walnut look good? my husband likes red mahogany —–what combination with red mahogany will look good. Provincial is a very nice color. Not sure it would be classed as a modern look though as it is quite traditional. Mixed with dark walnut would darken it and give it a more modern edge. As far as sheen, satin is definitely a more modern look. With red mahogany, if you like dark, deep rich shades then 50% that with 50% ebony looks stunning. It has the reddish hues in the light but dark in the evening or in shade. Hope that helps a little. It can be hard choosing can’t it. 1. Do you need a preconditioning stain or would waterpopping work just as well? 2. Which is better for dark floors oil or water base? I heard the oil gets a yellow color and I do not want it to look weird over time what do you recommend? 3. The same goes with the finish I am guessing if you use water base stain you have to use a water base finish any recommendations which brand finish you prefer? Thank you for all of your help in advance! 1. Water popping will work fine. 3. No you can use either type of finish over a water based stain. As far as finish recommendations, have a look at the last post in the series in the link above. Have you ever tried a mix of Ebony and Grey on red oak? ebony alone is too dark for me, ebony and jacobean too brown. I don’t seem to find any tests to lighten up the ebony taking away a bit of the red tinge of the red oak (my intent). I have red oak floors and want to stain a dark color. My great room adjoins my kitchen, but I have tile in that room. However, my cabinets are clearly visible. They are a dark brownish/red maple. I think I should match this or either go lighter (in the same tones but don’t want to). Any color suggestions would be greatly appreciated. I’ve mixed about every Minwax color combo I can think of. I kind of like Expresso/Red Mahogany mixed but am afraid it will be too red. I have about 1200 square feet in 3 rooms. What was the percentage mix of the Expresso/Red Mahogany mix? If it’s too red just add more Expresso to it. Make it 75/25 for example. If your kitchen is covered in tiles then there’s a pretty big separation between the two. I think you could make it work. Best to get some large samples though and see for yourself. Hope you can fins a shade you love Donna. Can you mix and use polyshades for the floor if you’re going to apply multiple coats, or should I just use regular stains then apply a Polyurethane over the top of the last coat? We definitely don’t recommend using Polyshades for floors. Use a good quality stain first and 2 or 3 coats of finish on top. I am refinishing my red oak floors and want to go darker. I am trying to decide between antique brown and rosewood. I have cream colored kitchen cabinets. I do not want the floor to have any red in it. Which color do you suggest? Sounds like Antique Brown would be better suited if you don’t want any red shades. Hi we ar putting down Dom brown wood look tile in hall and kitchen. The staircase and adjacent room are a oak hardwood.we are looking to stain them should they match if so it would be ebony stain.. we are afraid it will all look to dark is it ok to use Jacobean do you think it ebony on stairs and Jacobean in adjacent floor of living room? You could also do a blend of both if you like so it matches a bit better. This is a hard one because modern and traditional are very different looks. For shiny, you can choose a full gloss or semi-gloss finish. If you like dark but not ebony then Jacobean is very popular. It’s also probably the closest to a modern/traditional look too. 1) The grain and cut of the old wood vs the new wood. If the old wood is plain sawn and the new wood quarter sawn, there will be a difference. 4) And again as you said, it could be a white oak vs red oak difference. Hi I had professionals use the minwax ebony color on my floors. one coat didn’t look good and a second coat was added and it too dark. Can I add a jacobean on top to make it more brown? No I wouldn’t add more stain. We only ever apply a single coat. Any more and you start to have finish adhesion issues. The best way to get a darker shade is to water pop first. Did he do that? Hi! I just had my red/white oak hardwood floors stained with 2 coats of ebony/dark walnut. They are a really nice, dark, rich color. My floor guy uses masterline oil based poly in a satin finish, but I can’t find much information on this product. Of course I don’t want them to look dull, but I also want little to no shine to go with my industrial glam decor. I have read that different brands with the same sheen look different (i.e. one brand may look more matte while another brand may look more semigloss. different shine %’s or something). So, my questions are….Is this a good product to use on really dark floors? Is oil based poly better on darker floors? Will there be very little shine to their satin? Masterline is a entry level finish. We don’t use it so I don’t have any experience with it sorry. Satin still has some sheen to it, probably more than it seems you want. Try getting a matte sheen. Yes oil poly works well on dark floors. We are about to have our maple floors professionally refinished and stained. Our contractor has explained that it is best to only put 1 coat of stain. He says in his experience the color looks muddy with additional coats of stain. I was hoping that an extra coat of stain might help make the floors look darker and more consistent in color when dealing with the maple issue. We plan to use Duraseal Jacobean and he did a small sample on our floor. He didn’t waterpop the sample but plans to waterpop the floor before staining. What are your thoughts about 2 coats of stain? Your floor guy is correct. Only ever do 1 coat of stain. Otherwise there can be issues with the adhesion of the finish. We have just had our red oak floors sanded and prepped for staining this Thursday. Our original floors were stained Provincial (? )l and then Antique Brown (stairs and bedroom in 2006 addition). Meanwhile, our living, dining, family and kitchen have been prepped and we wanted to add a darker shade that would blend with antique brown. Would Jacobean or Dark Walnut be better to compliment with antique brown existing on stairs? I’d rather not have the “red” hues. Please advise. Thanks in advance. Sorry for the delay. I’m guessing you have chosen a color by now. I hope it looks great and you love your new floors. We are having our red oak floors refinished and extended through two other rooms. I want a rich brown without red undertones but as the light changes throughout the day I go from loving to hating a color. I loved coffee brown yesterday but now I’m worried about it pulling too much red. The man who applied the stain said it has green undertones to fight the red. What is your opinion of Duraseal Coffee Brown on red oak? I am trying to update the look of our home but not go too dark either. I also have Jacobean, and Ebony and combinations of those plus a water popped version too. Is Jacobean more red? It seems to be to me, but I read a lot more about the popularity of Jacobean than I do Coffee Brown. It’s really hard to say without seeing the floors, lighting etc in person. I say live with the samples for a week or so, take your time, look at them at all times of the day and then you’ll have a better idea. Personally, I like Jacobean. Hi, need recommendation asap re floor stain for red oak floors. I’m between Dark Walnut and Espresso to match with Antique Brown which is in a bedroom and down the stairs. Can you provide any insight as to which one I should choose (Minwax). Thx. That’s really a personal taste choice but to make it easier, grab some sample boards and stain both colors and put them up against the existing color and see what you prefer. Because it’s downstairs, it won’t be as critical compared to an adjoining room. Hi, I’m in need of help, I have oak parquet flooring on it’s way, plus the treds and banisters to do on my stairs, I’m loving the dark colours of Jacobean and Ebony, but love be in the uk, also need it to be tough as I have dogs(paws), I’ve been reading all your blogs, but still need it spelling out to me,ha, what do I use for all my surfaces, want it to look rich with a satin finish, please help, Thankyou Char. If you’re in the UK I’m not 100% sure about what finishes they have there. Pretty sure they will have Bona and Loba though. They both have great commercial grade water-based finish systems that will withstand your dogs paws and have a beautiful satin sheen. Hello, I have read many of your articles and have learned so much from you! Thank you for your blog! I would hire you in a second if I didn’t live in Arizona. I am about to have my character grade hickory engineered floors sanded for the second and last time and need some help on color and finish. I have a cherry cabinets and dark walnut and mahogany furniture. The floors are currently very dark and the last stain job was horrible. I am thinking of going natural but don’t know if the character grade hickory would clash with my kitchen and furniture. Can you suggest a color for me? Also, since I will not be able to sand the floors again, I am thinking of either using rubio monocoat or pallmans magic oil instead of poly. Do you agree with that? Thank you! That’s hard to say without seeing your place in person. I think going natural would most likely look OK though. 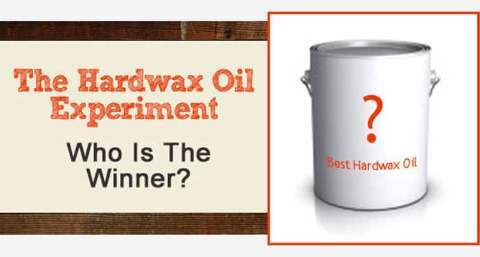 It would make them easier to maintain and spot repair down the road if you choose a hardwax oil. Try to get a large natural sample and live with it for a week or two. And yes, I would definitely recommend looking into using a hardwax oil. We are in Mi, just moved here from Downers Grove Il. We tried mixing 2 parts Kona Rustoleum with 1 part Royal Maogony Duraseal and put 3 coats of oil on top. In direct sun, when looked at from an angle, it gets a purple haze. Have you had this problem? Our contractor thinks it is just from the window reflecting on the sample and does not seem to think it will be a problem. We want to make sure we do not end up with purple floors. Time is of the essence as we are already delayed a few weeks trying to get the right color. Not sure what is happening there sorry. We never mix two different stain brands together and have never used Rustoleum either. I’m hoping you can help me to figure out if I should try to change the color of my Acacia floors. The builder installed this species and it has orange/brown tones to it. We have a 94lb Akita who has made some scratches and to correct it we need to sand it down so it would also be the time to change those orange tones to Jacobean or maybe dark walnut? I can’t find many examples online of Acacia and how it accepts stain. I have had one sample come back but it appeared blotchy. How much would it cost to stain a +15 year old oak floor a darker color per sq ft? Without seeing your floors in person, I would be just guessing. 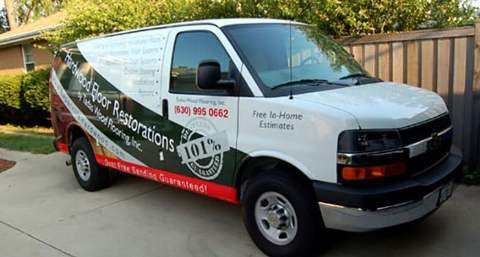 It depends on so many things like the condition of your floors, the layout of your home, what finish you want to use, are there repairs needed etc. Best bet would be to get someone out to have a look for you and give you a quote after seeing them. I just re did my hardwood floors in special walnut and the color came out way too light. Is there anything The floor guys can do to darken it? Why do the grains in the timber show unevenness in floor levels on a dark stained (Walnut) timber floor? The finish on the floor is semi gloss (50%).Can this be corrected or is that the natural appearance? Do you mean uneven sheen levels? If so, no, that isn’t normal. It’s user error. It will have to be buffed back and a new coat of finish applied. We just purchased a house with 60 year old red oak floors and have decided to remove all the carpet and replace the pee stained boards with new ones. We are refinishing them and I am so confused on which stain color to go with. Everything I read says go dark and no red or yellow tones. What colors would you recommend for a medium floor color and a dark color? We will be doing the water popping as I think I want them a little more uniform in color. Is Dark walnut too dark? And is special walnut too light and red? Colors are very subjective and personal. If you are going to be living in your home for many years, I would go with whatever you like. If you want to sell soon and want a popular color, Jacobean and Dark Walnut are safe bets and will always be long-term favorites. What are the 6 stain colors in the last picture? Hmmm… I would look at Driftwood, Grey, Birch and Twig to start with. Just had my dark floors sanded and finished with 3 coats of loba AT invisible. Some floor boards seem to contain stain in the white oak floors. Is this norma? Not sure what you mean exactly, but if you didn’t apply a stain, then no, that’s not normal. Is it markings or stains in the actual wood, or the finish? I just had white oak floors installed. We had them stained mix of Ebony and true black. They used the Glitsa Poly finish. Now I have these white lines in between the planks. What caused it and what can I do about it? I have american cherry floors and want to stain them darker. Is this possible to do. I’ve been told no in the past, but someone told me that with the new gel stains out there it is possible. I’m looking to get rid of the red and blonde tones in the wood. It is possible to stain cherry darker. We built our house and going with cherry cabinets, trim, baseboards, doors. And floors in three large rooms. At the moment I am indecisive on whether or not to stain our cherry floors. I decided on natural doors, trim and baseboard but torn on the floors, stain or natural? My cabinets are stained with a blend of 3 different color stains, 2 part (50%) cherry, 1 part (25%) mahogany and 1 part (25%) Jacobean. Some of the cabinets (they were custom made) were delivered today, they are gorgeous. Simply gorgeous. I am just not sure about staining the floors this same color with all the trim and baseboards being kept natural. I am hoping Tadas responds soon, maybe he could tell me if this would look alright or not. I have factory finished “Bellawood” Matte finish Brasilian Koa. We made a huge mistake of putting it next to a high-end medium to high gloss custom inlay rich older deep colored Cherrywood floor. A. Can we strip off the matte factory finish? B. Can we stain it darker? What color would you recommend? It currently (after 2 years) is just way too orangish and clashes terribly with the wood in the hallway. C. Can we put a medium to high-gloss finish to match the cherry floor? Your site is very informative! Might I ask you for advice? I did want dark floors up in Lake county. The stain is on (Drying) my red oak and I feel I’ve made a mistake and let them get too dark. (Ebony mixed with Red Mahogany 2:3). The finish has not been applied yet. Is there any way to dial back the color without re-sanding the entire floor and starting over? (either lighten it or make it a bit warmer with additional brown?). thanks for your advice!